it’s been hot in the city! so on monday, i served dinner cold. ok, truthfully, dinner at my house has to sit for a portrait most nights, so it’s often served cold. but this time, it was supposed to be cold. that’s the beauty of zaru soba noodles on a busy, hot weeknight. good noodles are key. i am lucky enough to have several unique kinds in my pantry–a gift given to me by a sweet co-worker. 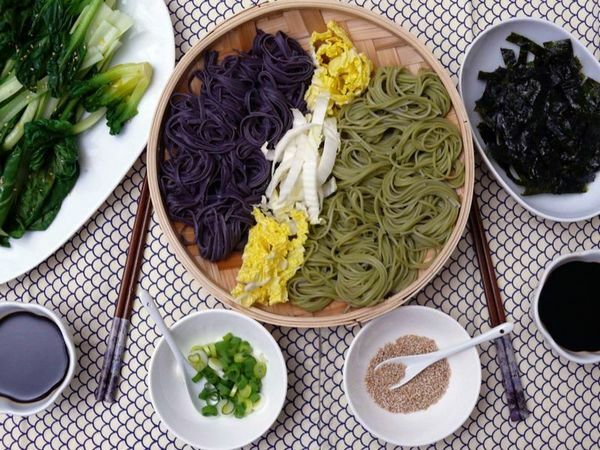 i used black rice (therefore technically not soba) noodles and very subtly flavoured green tea soba noodles. they were delicious, but i would still say that 100% buckwheat soba noodles are my favourite. after noodles, it’s all about the sauce. i turned to the amazing japanese food blog “just hungry” for tips on making a vegetarian dashi (i used both seaweed and shitake in mine) and kaeshi to combine for my sauce. this may sound fussy, but the hands-on time was, oh…about five minutes. after that, it was just a matter of boiling, rinsing and serving the soba noodles. making the little bundles took an extra couple of minutes but it was so worth it. you can pick up a perfect little serving to dip into your sauce, instead of having to battle tangled noodles each time. i had a a bunch of water spinach and some napa cabbage that needed to be used up. i steamed the spinach over the same water i was boiling for the noodles, and sprinkled toasted sesame seeds and a drizzle of sesame oil on top. the napa cabbage was sliced and served raw to be dipped and crunched. the only thing missing was a cold beer. how i could have overlooked that, i don’t know. What beautiful plating! And the colour of those black rice noodles is amazing. thanks, su-lin! i didnt like the texture AS much as real soba noodles but i would make them again just for the colour.